We take it for granted that urinals flush. With each pull of the lever, gallons of clean water come to whisk away a few ounces of pee. If you think about it, it’s actually pretty wasteful, and the current drought is convincing facilities to consider waterless urinals. But these waterless bathroom contraptions have had to fight a long, hard road to acceptance. In April, California passed new bathroom appliance standards requiring that new urinals starting in 2016 use no more than 0.125 gallons of water per flush—forcing Californians to turn to pint flush urinals, or even more radically, waterless ones. “We’re seeing a huge uptick in inquires,” says Andrea Chase of Los Angeles-based Falcon Waterfree Technologies, a leading waterless urinal company. Maybe you’ve come across one already, especially if you live in water-conscious California. 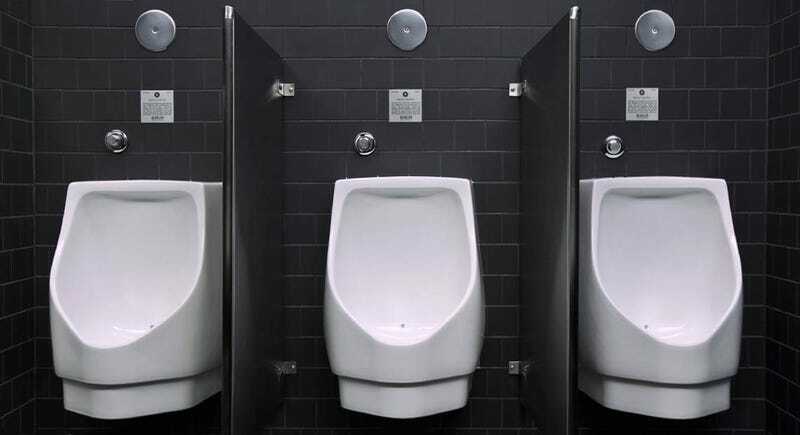 Falcon’s waterless urinals are installed at the Hollywood Bowl and Staples Center, to name two big stadiums that deal with voluminous amounts of pee. But if you’ve never noticed one, the waterless urine can seem like an odd concept. To plumbers, it goes against their very livelihood. For years, plumbers’ unions fought to keep waterless urinals illegal. And even today, the urinals have to be installed with all water pipes in place, just capped off behind the wall. Why does a urinal need to flush? Urine, after all, is liquid that easily falls down the drain. For those of us who haven’t spent much time mucking around the pipes, the answer may not be so obvious: odor. In an ordinary urinal—or toilet for that matter—water pools in a U-shaped trap under the drain, forming a seal against sewer gases below. Most waterless urinals, then, are more than an ordinary urinal without the capacity to flush. A cartridge of liquid sealant sits on top of the drain in a waterless urinal. The liquid is lighter than the urine, which sinks through the cartridge and drains out. The sealant keeps any sewer gases from backing up. A cartridge lasts about 7000 uses and costs $35. Not terribly complicated, right? But waterless urinals faced massive opposition when they first came on the market. It didn’t help that when maintained improperly, they clogged and belched up sewer gasses. Before waterless urinals were invented, plumbing codes were not equipped to deal with urinals that didn’t flush. Hence, by the dint of history, waterless urinals started out as illegal devices. It was an uphill battle from day one. Back in 2010, Joshua Davis recounted in Wired the epic battle between Falcon Waterfree Technologies and plumbers. There have been other waterless urinal companies before, but Falcon figured out the (profitable) business plan of replaceable cartridges. Falcon also had a powerful former Hollywood exec as CEO and well-connected people on its board. The waterless urinal hasn’t killed anyone yet. And the tides were turning, as the promise of water (and cost!) savings convinced customers to give the technology a try. Now, they’re legal in nearly every state. But, as a concession to plumbers, they do still have to be installed with all the standard plumbing, including unnecessary pipes. The plumbers’ insistence on standard pipes for waterless urinals was vindicated only in early, unsuccessful uses of the technology. Waterless urinals were ripped out and replaced with ordinary ones at several locations, including even the offices of the California EPA in Sacramento. They stank too much and clogged too often. Falcon, for its part, still recognizes the difficulties of undoing years of habits formed with flushing urinals. This summer, it’s coming out with a hybrid model, which automatically flushes small amount of water once a day to keep blockages at bay. It takes human error out of the equation. Ideas are easy, building something is hard, and convincing people to actually use it? Possibly the hardest of all. Waterless urinals have been a long time coming, and with this drought, they’re not looking so bad.